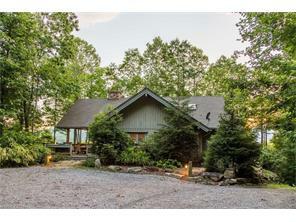 Very private log cabin at Balsam Mountain Preserve, perfect vacation home. Hike right from your front door to miles of trails, waterfall & creek. Mountain views & surrounding nature make this a delightful escape. Enjoy outside living on the covered porch with stacked stone fireplace. Amenities incl: Arnold Palmer Golf Course, htd pool in summer, Hard-Tru tennis, dining at Boarding House w/cabins for guests, Nature Center. Membership not required for ownership but needed to access Club amenities.